There’s nothing quite like like-minded company, and the city’s film buffs seem to have discovered that. Right from the 70s, Bangalore has had a long tradition of film clubs that offer up alternatives to big-ticket blockbusters, spurring debate and building a community while at it. Here are six of our favourites. Currently abuzz with preparations for the Bangalore International Short Film Festival (August 28-30), Suchitra Film Society has been the home for film enthusiasts in the city since 1971. Screenings are usually free; you can find more information at their Facebook page here. Khula Manch is more a platform and collective than a simple film club, and it often collaborates with the other film clubs listed here. However, they often use the medium of cinema to raise critical questions relevant to our times. Recent screenings have included Mahua Memoirs and Children of the Pyre. Screenings are free. Visit their website here or their Facebook page here for details and to suggest a film for screening. The film club at the Alliance Française de Bangalore organises screenings on the fourth Thursday of every month. Screenings include films by French New Wave directors such as Jean-Luc Godard and François Truffaut, and silent era filmmaker Georges Méliès. The screenings are usually followed by a discussion. Where: 108, Thimmaiah Road, Opp. UNI Building, Vasanthnagar. Screenings are free. Find more information, including their schedule for the year, on their website here or their Facebook page here. The media and arts collective organises city walks, talks, and concerts, but their one-of-a-kind screenings are not to be missed. See, for example, Strike, their labour film festival coinciding with May Day, or their recent Independence Day screening of Perfumed Nightmare. Screenings are free. Find them on Facebook here. 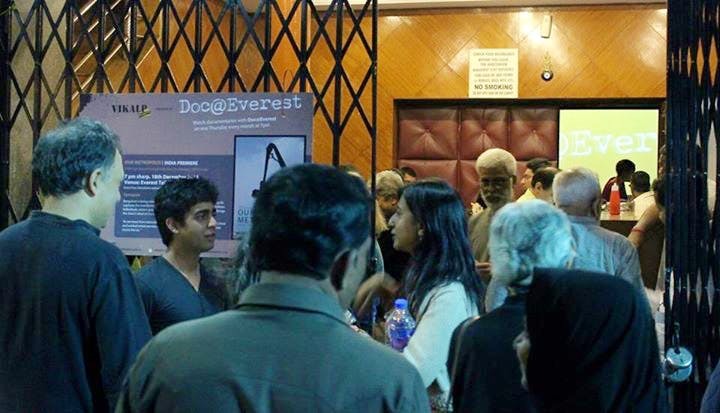 One of the veterans of the film society scene in Bangalore, the Bangalore Film Society (BFS) is known for its screenings, film festivals, and its close association with the film journal Deep Focus. Where: 33/1-9, IV Cross, Thyagaraju Layout, Jaibharath Nagar, M.S. Nagar P.O. Unless otherwise stated, screenings are free. Membership starts at INR 700 for an individual; forms can be downloaded from the BSF website here. Find them on Facebook here for updates. More a loose community of documentary filmmakers than a regular film club, Vikalp is worth keeping an eye on for their occasional screenings and their enduring focus on progressive politics. Screenings are free. Visit their Facebook page here for details on the next screenings.